The window of our home overlooks an expansive private courtyard and garden. Weather permitting, almost every day I see men, women and children playing out there with their canine companions. Sometimes they simply rest together underneath the shade of a tree. On occasion, I even hear interspecies “conversations” going on. It’s actually a really beautiful sight to behold. The connection that is present between animals and humans is a profound one indeed. This observation has not escaped both traditional and modern health practitioners. 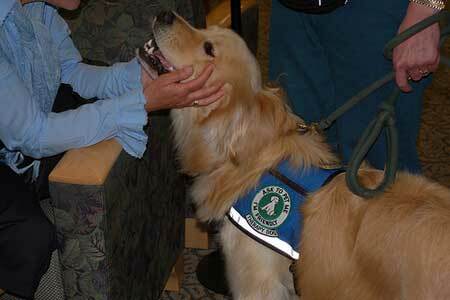 Today’s column delves a bit into the research that exists on animal-assisted therapy (AAT). Another positive aspect of this mind-body approach is that its use may decrease the need for certain medications. Prescriptions that are typically used to treat a gamut of conditions – constipation, heart disease, pain, psychiatric conditions – may be reduced thanks to the symptomatic strides brought about by AAT. (24) I’m not suggesting that specially trained animals can replace standard medical care. But it does appear that they may be able to reduce the need for certain medications in some people. Of course, such adjustments in medication dosage should be conducted with the assistance of a health professional. Not all alternative treatments come in a bottle or at the point of a needle. The very best complementary therapies tap into the basic human need for connection and contact with those that can provide unconditional caring and love. In AAT we find a mode of healing that provides as much benefit to the patient as it does to the “therapist”. To my mind, this is an ideal form of holistic medicine. I’ve always enjoyed fish myself and have first started the hobby 8 or 9 years ago. I can definitely say that I’ve witnessed quite a bit of those healing abilities fish, like most pets, affect humans with. Pets are truly remarkable creatures. Great input re: the healing power of fish. I am loving following your blog! As a psychologist, I can’t agree with you more: healing involves CONNECTION…in a related not, check out my challenge this week! I’m sure you’ve heard the old wives tale about asthmatics benefiting from having a dog, usually specifying a Chihuahua. My late sister, who died from asthma, was told that the unscientific theory was that the dog would “steal” the disease from the sufferer. My sister was too tidy a housekeeper to ever consider such a remedy. I, on the other hand, sleep with a Jack Russell and my asthma is pretty much gone, though I attribute my cure more to acupuncture. Buddy, by the way, has developed a mild case of asthma and wheezes when he 1st awakens. There are many nursing facilities I go to where the animals LIVE there, and go from room to room. They curl up on a patient’s bed or chair. Or stretch out on a window sill. As a Hopsice Nurse, I have placed MANY a Canine Companion on the lap of a dying person..or in bed next to the patient. It helps the animals, too! Maybe Buddy needs a Chihuahua play mate or some acupuncture. That’s awesome, Anne. I hope more of that kind of compassion makes it’s way into the medical system. My cat and I are an animal-assisted therapy team in Portland, OR. I love your article, and have pinned it to my AAT board on Pinterest. Thank you for the detailed descriptions of the benefits of this therapy. I will be forwarding it to some of the people I meet in our work who are interested in starting this at more retirement centers around our area. We have a miniature horse, Scooby Boo that has been doing animal assisted therapy in Tampa Bay, Florida for three years. He has brought a great deal of health and healing, emotionally and physically to many. Thank you for the article. I will be sharing it! Many thanks, Karen and Robin! I appreciate the important work you do and your support! The use of Animal-Assisted Therapy in adolescents with acute mental disorders: A randomized controlled study. OBJECTIVES: The aim of this study was to compare the effects of Animal-Assisted Therapy (AAT) with a standard treatment protocol in children and adolescents admitted to the psychiatry hospital for acute mental disorders. We used a methodology involving high quality standards for AAT research. DESIGN: A pre-post experimental design with a randomized controlled trial (RCT) in 34 hospitalized patients (17 treatment, 17 control) was carried out. MAIN OUTCOME MEASURES: The study focused on improvement in clinical status including, global functioning measured by the Children Global Assessment Scale (C GAS), format of care and ordinary school attendance measured by a rating scale. RESULTS: Our results indicate a statistically significant improvement in global functioning, reduction in format of care and increased ordinary school attendance in the treatment group, but not in the control group. CONCLUSIONS: Our results verify that AAT can have significant positive effects on therapeutic progress and the recovery process. PLoS One. 2015 Jun 3;10(6):e0125813. Post-operative benefits of animal-assisted therapy in pediatric surgery: a randomised study. BACKGROUND: Interest in animal-assisted therapy has been fuelled by studies supporting the many health benefits. The purpose of this study was to better understand the impact of an animal-assisted therapy program on children response to stress and pain in the immediate post-surgical period. PATIENTS AND METHODS: Forty children (3-17 years) were enrolled in the randomised open-label, controlled, pilot study. Patients were randomly assigned to the animal-assisted therapy-group (n = 20, who underwent a 20 min session with an animal-assisted therapy dog, after surgery) or the standard-group (n = 20, standard postoperative care). The study variables were determined in each patient, independently of the assigned group, by a researcher unblinded to the patient’s group. The outcomes of the study were to define the neurological, cardiovascular and endocrinological impact of animal-assisted therapy in response to stress and pain. Electroencephalogram activity, heart rate, blood pressure, oxygen saturation, cerebral prefrontal oxygenation, salivary cortisol levels and the faces pain scale were considered as outcome measures. RESULTS: After entrance of the dog faster electroencephalogram diffuse beta-activity (> 14 Hz) was reported in all children of the animal-assisted therapy group; in the standard-group no beta-activity was recorded (100% vs 0%, p<0.001). During observation, some differences in the time profile between groups were observed for heart rate (test for interaction p = 0.018), oxygen saturation (test for interaction p = 0.06) and cerebral oxygenation (test for interaction p = 0.09). Systolic and diastolic blood pressure were influenced by animal-assisted therapy, though a higher variability in diastolic pressure was observed. Salivary cortisol levels did not show different behaviours over time between groups (p=0.70). Lower pain perception was noted in the animal-assisted group in comparison with the standard-group (p = 0.01). CONCLUSION: Animal-assisted therapy facilitated rapid recovery in vigilance and activity after anaesthesia, modified pain perception and induced emotional prefrontal responses. An adaptative cardiovascular response was also present. Psychiatr Prax. 2015 Oct 21. [Establishment of an Animal Based Therapy at a University Hospital for Psychiatry: Results of a Preliminary Study and Future Prospects]. Objective: Dogs have been integrated in human society over centuries. This process has selected unique social and communicative skills. Dogs are thus able to represent social substitutes for human counterparts in cases of social withdrawal. Furthermore, dogs act as “social catalysts” in promoting interhuman encounters. Thus, the integration of dogs in psychotherapeutic concepts addressing social and interpersonal deficits may be of special interest. Methods: The present investigation reports the results of a pilot study to establish animal-assisted therapy (dogs) at a psychiatric department. The animal-assisted intervention straddled the following areas: (1) contact making, communication and orientation to needs, (2) recreation and play, (3) outward orientation, (4) release and farewell. The sample comprised 22 subjects. Results: The results demonstrated in particular that the animal-assisted intervention significantly promoted unspecific aspects of positive affectivity and wellbeing. Evaluation of the overall acceptance of the dog on the psychiatric ward revealed very positive feedback. Conclusions: We conclude that animal-assisted therapies represent a significant enchrichment of the therapeutic context, that may be used to enhance the patients’ openness and adherence to conventional therapies. Effectiveness of Animal Assisted Therapy after brain injury: A bridge to improved outcomes in CRT. BACKGROUND: Animal Assisted Therapy (AAT) has been widely used as a complementary therapy in mental health treatment especially to remediate social skill deficits. The goal of AAT is to improve social, emotional, and cognitive functioning. OBJECTIVE: The purpose of this article is to draw upon the literature on AAT and explore specific applications to cognitive rehabilitation therapy (CRT) and social skills training. METHODS: This study provides a systematic review of most of the available literature on ATT and assesses that potential uses of ATT for brain injury rehabilitation. RESULTS: Although the efficacy of AAT is not currently well documented by rigorous research, (Kazin, 2010) anecdotal evidence suggests that brain injury survivors may benefit from the combination of AAT and cognitive rehabilitation techniques. CONCLUSIONS: Acquired Brain Injury (ABI) survivors with cognitive impairments can benefit from AAT as part of a comprehensive and holistic rehabilitation treatment plan. Clin Psychopharmacol Neurosci. 2016 Nov 30;14(4):357-364. The Effects of Equine-assisted Activities and Therapy on Resting-state Brain Function in Attention-deficit/Hyperactivity Disorder: A Pilot Study. Objective: Equine-assisted activities and therapy (EAA/T) have been used as adjunct treatment options for physical and psychosocial rehabilitation. However, the therapeutic effects on resting-state brain function have not yet been studied. The aim of this study is to investigate the effects of EAA/T on participants with attention-deficit/hyperactivity disorder (ADHD) by comparing resting-state functional magnetic resonance imaging (rs-fMRI) signals and their clinical correlates. Methods: Ten participants with ADHD participated in a 12-week EAA/T program without any medication. Two rs-fMRIs were acquired for all participants before and after EAA/T. For estimating therapeutic effect, the regional homogeneity (ReHo) method was applied to capture the changes in the regional synchronization of functional signals. Results: After the EAA/T program, clear symptom improvement was found even without medication. Surface-based pairwise comparisons revealed that ReHo in the right precuneus and right pars orbitalis clusters had significantly diminished after the program. Reduced ReHo in the right precuneus cluster was positively correlated with changes in the scores on DuPaul’s ADHD Rating Scale-Korean version. Conclusion: Our results indicate that EAA/T is associated with short-range functional connectivity in the regions related to the default mode network and the behavioral inhibition system, which are associated with symptom improvement. J Pediatr Nurs. 2019 Mar 7;46:55-61. The purpose of this study was to evaluate the effect of a brief pet therapy visit and a comparison intervention on anxiety in hospitalized children. This quasi-experimental study compared state anxiety before and after structured research interventions in a convenience sample of children between the ages six and 17 (N = 93) in two groups. Participants were assigned to the pet therapy group or control group, based upon timing of data collection. Participants in each group received either a visit from the research assistant, therapy dog and handler, or from the research assistant for completion of a puzzle. The child’s anxiety was measured using the State-Trait Anxiety Scale for Children (STAIC) S-Anxiety Scale before and after the visit and parents completed a brief background questionnaire. Intervention and comparison groups had no significant differences in key demographic factors or baseline anxiety level. While state anxiety decreased significantly in both groups, children in the pet therapy group experienced a significantly greater decrease in anxiety (p = .004). In addition, parents reported high levels of satisfaction with the pet therapy program. Study findings provide support for a brief pet therapy visit with a trained dog and handler as a tool decrease to anxiety in hospitalized children while promoting parent satisfaction. When resources for providing pet therapy visits are limited, clinicians may consider prioritizing children who are most affected by anxiety. Soc Work Health Care. 2019 Apr;58(4):412-430. Service dog training programs for veterans with PTSD: results of a pilot controlled study. Service dog programs are increasingly being explored as complementary or alternative interventions for military veterans with posttraumatic stress disorder (PTSD). This paper details the results of a control group, pre-and-post pilot investigation evaluating the use of a 14-week service dog training program for veterans in central Florida. Thirty veterans diagnosed with PTSD, 15 in the intervention group and 15 in the waitlist controlled group, completed all pretests and posttests measures, consisting of the 136-item Trauma Symptom Inventory-2 and the 36-item World Health Organization-Disability Assessment Schedule 2.0. Compared to demographically similar veterans in the control group, participants who completed the service dog training program demonstrated significant decreases in posttraumatic symptomatology, intra/interpersonal difficulties associated with psychological trauma, and in disabilities secondary to their PTSD. Study findings, in combination with results from two other recently published controlled investigations, provide evidence supporting the endorsement and use of service dog programs as helpful complementary or alternative treatment options for some veterans. Social work practitioners may want to consider referring their veteran clients with PTSD to qualified service dog programs for adjunctive support when they are having difficulty engaging with or benefiting from office-based traditional therapy approaches. J Autism Dev Disord. 2019 Mar 21. Effects of Dog Assisted Therapy for Adults with Autism Spectrum Disorder: An Exploratory Randomized Controlled Trial. Effective treatments of highly prevalent stress-related outcomes such as depression and anxiety are understudied in adults with autism spectrum disorder (ASD). A randomized controlled trial with baseline, post-intervention, and 10-week follow-up, that explores the effects of animal assisted therapy (AAT) was conducted. In total, 53 adults with ASD with normal to high intelligence were randomized in an intervention (N = 27) versus waiting list control group (N = 26). The remarkable adherence to the therapy program by study participants and the program’s clinically relevant effects indicate that AAT with dogs can be used to reduce perceived stress and symptoms of agoraphobia, and to improve social awareness and communication in adults with ASD with normal to high intelligence.